Ten wins. Let that sink in for a second or two. Ten wins?!?! No losses. If you’re an Auburn Tiger, every morning is biscuits and gravy. Let’s cruise around the sites and see what we can find this morning. I’ll be updating throughout the a.m. I had a spartan breakfast of black coffee and pumpkin bread. What are you having? Better two-fist those biscuits while they are hot. Or maybe eat one as is and pour the gravy on the other? Gravy on both? Eat the biscuits with a gravy chaser? Endless possibilities. Oh yeah, the road to the SEC championship and BCS title game sorta goes through Tuscaloosa right now. But it will be more of a rest area exit (filled with unsavory rest stop characters, you know, like the shirtless guy smoking on the picnic bench) for our Tigers by beating the Georgia Bulldogs next week. How about this headline and lede from the Associated Press on the LSU win? BATON ROUGE, La. — As Les Miles’ latest stab at fourth-down trickery was about to unfold, the LSU coach bent down, snatched up some blades of grass — and ate them. 10:20 a.m. CST: Waiting on this guy’s yearly screed on how much he hates Auburn (because some of our fans took clippings from their fancy bushes at Sanford Stadium after an Auburn win or something … I forget) and the back-and-forth on Track’em. My thoughts on Georgia? Meh. I like playing them and there is no hate here. I like the history of the rivalry and the common roots of the opposing players. We’re due, BTW. Dude should take a deep breath and just except the inevitable this year. With pain comes release. 9:50 a.m. CST: Something to chew on (gristle in the sausage … bleah! ): A lot of folks out there have claimed the reports of Urban Meyer’s involvement in this mess as bunk. Phillip Marshall and Will Collier were two of the first to mention it and they were quickly discounted as “some Auburn bloggers” in print and on radio. But what to do about The Birmingham News‘ Goldberg and Scarbinsky coming on the scene yesterday with their (sadly unnamed) source that says Florida Coach Urban Meyer was involved? Is The Birmingham News reputable enough for you? For those counting at home, there are possibly two to four unnamed sources out there with this information about Meyer. And now this morning Doug Segrest offers a Kenny Rogers background piece. I know that we shouldn’t put any eggs in the Rogers basket (since he is under the investigation of the NFL and all) … but here are some folks coming to his defense. 9:10 a.m. CST: So one of my questions has (sorta) been answered about Miss. State’s former QB John Bond (this via HABOTN). It looks like ESPN and/or the NYT called him to “verify” the story. Someone else actually tipped them off about it. And ESPN and the NYT had a, well maybe not aFACTUAL ERROR! per se in their report, but Kenny Rogers did not contact Bond person to person as was IMPLIED in the first round of stories. ERROR OF OMISSION? There were supposedly two people in between Rogers and Bond. That is, if we take Bond at his word. (Do we?) I mean what do we make of these statements in ESPN’s original story? “[Kenny Rogers] said it would take some cash to get Cam,” Bond said. So this seemingly direct message was communicated through two other people before reaching Bond who *still* hasn’t spoken to Kenny Rogers in more than 20 years? Keep reporting folks. I am placing my faith in a skeptical Alabama press corps. 9 a.m. CST: Chris Low of ESPN *grrrrrrrrrrr* gives us his learned thoughts on the SEC this morning. And like I said before, it’s nice to see Auburn (even in playing UTC) at the top of these lists almost every week. 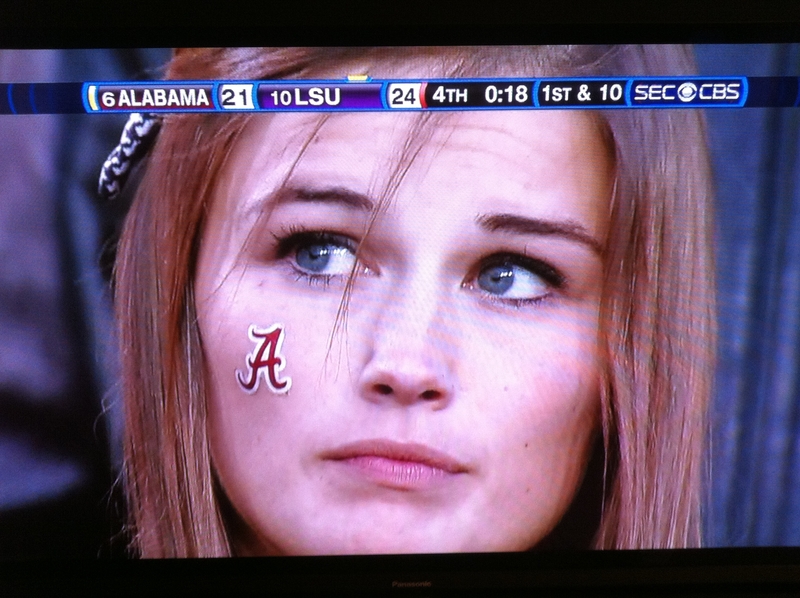 Low wonders what happened to Alabama’s vaunted running game. Les Miles, you old dog, you’ve found a buffet under your very own feet! And Auburn’s “Alabama Forages” gives us a surprising result on the “weed” crabgrass! Other things being equal, the first harvest of the year will result in the best hay, sometimes containing more than 15% crude protein and 65% total digestible nutrients. Crabgrass hay normally cures more slowly than bermudagrass, but more quickly than sorghum-sudan hybrids or pearl millet. Hay of crabgrass is dark in color and consequently may not look as good as it is. CBS’s aptly and starkly named College Football Blog (now with your daily recommended dose of Jerry) tells us what we’ve learned in the SEC and offers a link to the grass-eating coach. Jerry was on Pac-10 duty again and gives us a Dose o’ Ducks. Chuckles and laughs were had by all. Cool as a cucumber folks. Cool as a cucumber. * Notice the “double quotes” at the end there? I actually think that is the right punctuation because of the quote within the quote with the dropped off “g” in “messing.” It sure looks odd though. Breakfast- Coffee followed by coffee for desert. Splendor in the grass? The greatest feeling is knowing that Ten and, Oh the Tahd has duece on the loss column? Splendor indeed. 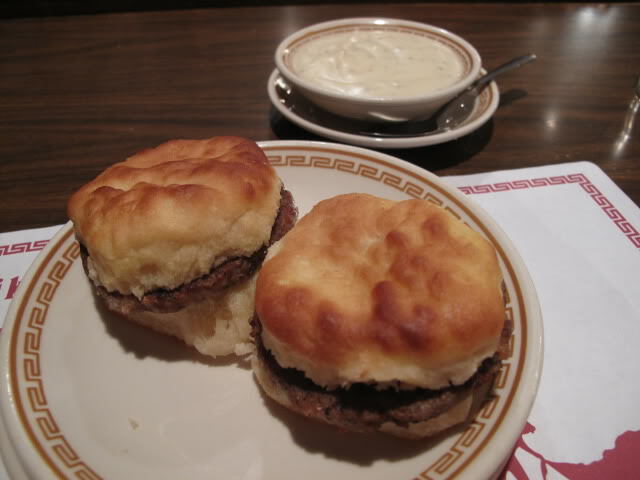 The crazy thing is… I woke up craving sausage gravy over buttermilk biscuits. If only all Bamers were that pretty… and always had that look of sorrow. I’m making that my desktop at work, tomorrow. Nikki’s West, haven’t been there for breaky but many times for lunch. You better figure out what you want or a trap door open and you end up in Shades Creek. Also, the meat server looks like Bo Jackson.